I hated this movie. I didn't so much hate it at the beginning when they were in the middle of getting together and all, but when they started doing all that bad stuff to their ex-husbands. This movie did NOT make me feel good at all. It depressed me. It enraged me. I never saw the 3 guys ever do anything back. What they did to those guys was just plain mean. I mean, what the hell did the death of their 4th friend have to do with their ex-husbands cheating on them? I mean, it's one thing to teach them a lesson when they're still married, but when they're divorced, that means they are ENTITLED to have the freedom to go for other women. Men get dumped by women all the time for better-looking guys, but you don't see these guys putting their ex-wives through that kind of hell. When I saw First Wives Club in the theater, I was not expecting for it to effect me as much as it has. This movie is not about three women just getting revenge on their ex-husbands. More importantly, it deals with long-lasting friendships and how hard that they are to maintain. It took a common college friend's funeral to reunite these three women. Their dead friend wasn't so concerned about her ex-husband, but about the loneliness that she would feel without him being a part of her life. I believe that anyone who has ever been in a relationship can understand that feeling of being alone without anyone in your life. This is what I like about this movie. It signifies that what we need in our lives are friends to share the good and bad times. We do not need friends to be there as a substitute for a significant other. Midler, Hawn, and Keaton do a great job in portraying long time friends, who in their need to exact revenge on their former husbands, discover that what they really needed was each other to help them rediscover their self-esteem. I would love to see the three women unite to do another movie. They have a wonderful chemistry together. I heard that they actually got along rather well on the set. I guess I'm a bit behind the eight ball - I just watched this movie for the first time last week - and it was great!!! Goldie Hawn, Diane Keaton & Bette Midler work wonderfully together in this movie, and they each play their characters to the hilt!!! The gist of the movie is that these women were all great friends during their teen years but had lost touch through the years. The suicide death of one of their "group" brought them all together once again. While catching up, they realized that they were all going through similar situations in their marriages - they were all being cheated on by their husbands! Once they figure this out, they decide to put their heads together to come up with inventive ways to get back at their husbands for doing this to them - and I must say they do an excellent job at it!!! The distinctive thing about this movie for me is that it is superficially adequate, but a very, very bad movie upon closer examination. For example, It must be a comedy since it can not fall into any other genre, but it is not funny. Somehow, this is not immediately obvious until afterwards when you reflect back upon what you have seen. I can not really explain this characteristic of the movie. To continue, the movie is about the revenge of three women against their ex-husbands who have left them for younger women. In the process, the children are used against the fathers. Blackmail is utilized. I don't have a problem with this. Funny movies have been made about canibalism. Funny movies have been made about divorce. However, if you are going to make such a movie, it has to go over the top. This movie handles everything like a sitcom. To make matters worse, it seems to realize at the end that it has gone too far and become politically incorrect. At root, the movie is making a statement that all men all scum. Once it gets to the end, it proceeds to spend an interminable amount of time in trying ot redeem itself by having the three women open a crisis center for women. This entire period is very, very, very long without any laughs. I mean without any jokes. ownership of the house, custody of the kids, and alimony. These women are out for vengeance and they get it. Three college friends are reunited by the death of another college friend. Though they were incredibly close in school, their lives drifted apart afterwards. One became an actress (Goldie Hawn), one became a timid housewife (Diane Keaton) and the other became a very assertive housewife (Bette Middler). After all these years, there is only one thing that they have in common. All three have been dumped by their husbands in favor of younger women. They're not going to take it laying down and decide to recoup their losses, wreack havoc and have some fun doing it. This is a very entertaining film. The characterizations are strong almost to the point of being charactures but there is some depth to it as well. These women are dealing with real pain. In accordance with the old maxim that shared pain is lessened, they share first with each other and then with their ex-husbands. I almost feel sorry for the cretins near the end but not quite. A riot by all accounts! "If only she'd called me. If only I was listed!" 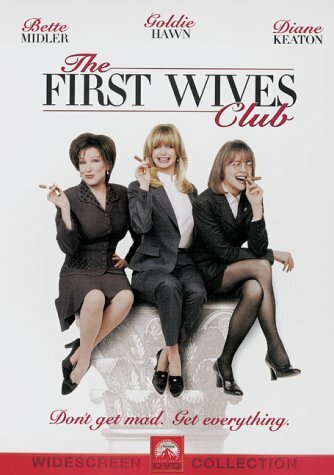 In 1996, Hugh Wilson directed a very funny comedy about three friends that were all dumped by their husbands for younger women in the film "First Wives Club". Based upon the 1992 novel of the same name by Olivia Goldsmith (1949-2004), the three friends (who had met in college) are brought back together after their fourth friend, Cynthia Swann Griffin (Stockard Channing), jumped from her penthouse apartment in Manhattan after her husband left and she felt totally alone. Upon learning about each others similar marital problems, the surviving friends, which include the boisterous Brenda Cushman (Bette Midler), the movie actress Elise Elliot (Goldie Hawn) and the timid Annie Paradis (Diane Keaton), decide to work together to attain vengence upon their ex-husbands. Brenda's ex-husband, Morton 'Morty' Cushman (Dan Hedaya), wants to marry the very young and shallow Shelly Stewart (Sarah Jessica Parker). Elise's ex-husband, Bill Atchison (Victor Garber), is dating the very young aspiring actress Phoebe LaVelle (Elizabeth Berkley). Annie's separated husband, Aaron Paradis (Stephen Collins), is having an affair with Annie's therapist, Dr. Leslie Rosen (Marcia Gay Harden). To assist them, the trio of first wives enlist help from their friends, which include the interior decorator Duarto Feliz (Bronson Pinchot), Annie's daughter Chris Paradis (Jennifer Dundas), the socialite Gunilla Garson Goldberg (Maggie Smith) and Brenda's Uncle Carmine (Philip Bosco). For a movie with a pretty big idea--that women whose husbands leave them for younger women can regain their dignity, control, and even, in some cases, their husbands--this is a pretty trifling affair. It's embarrassing to listen to Diane Keaton reduce all her acting talent to a 90-minute stream of shrill screams and whines and whimpers. Goldie Hawn's character undergoes plastic surgery, but that's not enough to explain the way she contorts her face throughout the film. And when Bette Midler and the other two get together to burst into song, watch out. You'll probably wince. I Loved This Movie! Really Really Good Movie! Great Cast!